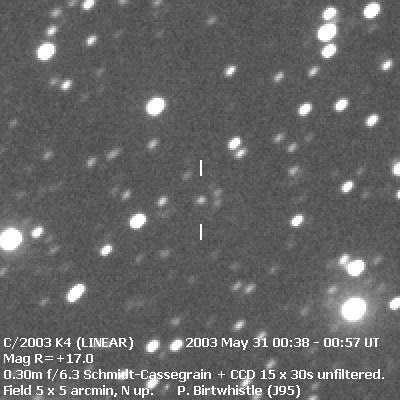 Discovered on 28 May 2003 by the LINEAR team and announced on 30 May 2003 on IAUC 8139 the image below was obtained just a few hours later. It was 5.9 AU from Earth and 6.1 AU from Sun and due at perihelion just over 16 months later at a distance of 1.02 AU from the Sun. Almost exactly a year later the comet had approached to 1.7 AU from Earth and 2.2 AU from the Sun. The image has been log stretched to try and bring out details of the inner coma as well as the faint tail, but even so the coma hides most of the short stubby dust tail pointing to the lower left. The gas tail can be seen extending to bottom right with some streamers close to the coma. A fainter disconnected portion of tail can be seen at the bottom of the field beyond the bright star.